Ecuador has a Mestizo majority, along with significant minorities of people with indigenous, African, and European ancestries. 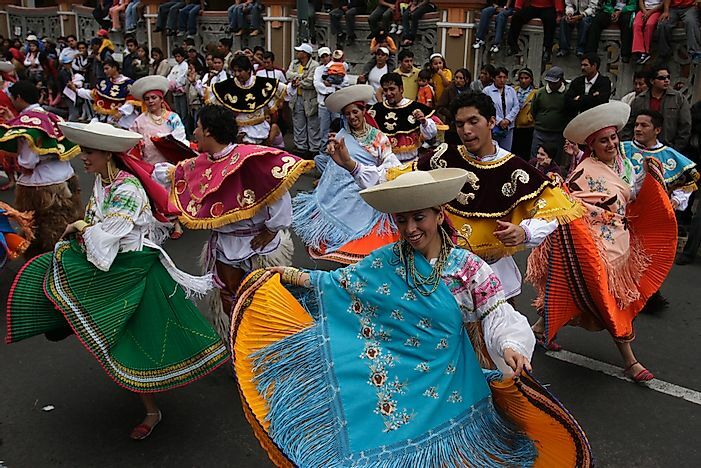 Ecuadorian dancers perform in a carnival in Riobamba, Ecuador. Editorial credit: nouseforname / Shutterstock.com. The Republic of Ecuador is a representative democratic country in the northwestern part of South America. The country has a population of more than 16 million people and a majority of Ecuadorians can trace their ancestry to three major geographical origins of human migration who inhabited South America. The three largest groups settled in Ecuador about 15,000 years ago and they include the indigenous pre-Hispanic groups, Europeans mainly the Spaniards who arrived five centuries after and colonized most of South America and the black Africans mainly from the sub-Saharan part which the Spaniards imported as slave labors during their colonial era. The result of mixing the two or three of the groups gave rise to new ethnic groups in Ecuador. Ecuador has a Mestizo majority, with significant minorities of people with indigenous, African, and European ancestries. The Mestizos are multiracial people of mixed European and Amerindian bloodline. During the Spanish colonial era in Ecuador, they invented a complicated system of distinguishing between racial mixtures for purposes of racial profiling used for social control and a determinant of one's position in society. During the colonial era the White Spanish conquerors were the minority but with time sired offspring with the native people of Ecuador. With time the Amerindian population declined due to war and European diseases while the mestizo population predominantly emerged. At present, the mestizos are by far the largest ethnic group in Ecuador accounting for 72% of the total population. The Montubio are an aboriginal mestizo group that originates from the coastal part of Ecuador. Initially, the Montubio were not recognized by the Ecuadorian government until 2001 following some protests that consisted of prolonged hunger strikes. The Montubios are best known for activities such as rodeos and ranching and tools such as the machete. The Montubio account for 7% of the Ecuadorian population. African Ecuadorians are descendants of the African slaves that were imported into Ecuador by the Spanish colonialists. The African Ecuadorians are mainly located in the northwestern coastal region of Ecuador. The African Ecuadorian's most known cultural influence is the Marimba music. The African Ecuadorians account for 7% of the total population. The native South Americans are the first or original group of people to occupy what is present day Ecuador. The native South Americans are said to have migrated from Asia while other theories suggest that they migrated from Oceania through the Pacific Ocean and from Europe through the Atlantic. The indigenous people of Ecuador were hunters and gatherers and practiced agriculture. The native South American population in Ecuador drastically declined during the Spanish colonial era following some wars and epidemic diseases such as cholera, measles and smallpox. The native South Americans account for 7% of Ecuador's population. The White Ecuadorians originated from Europe in the 17th century they are mostly of Spanish ancestry from the colonial era and locally born Spaniards also known as criollo. During the Spanish colonial period, the White Ecuadorians sired children with the indigenous people of Ecuador to give rise to a new generation of an ethnic group that has continued to dominate the population of Ecuador. Currently, the population of White Ecuadorians accounts for 6% of the population. The descendants of Ecuador's population mostly originate from the Spanish immigrants and the native South American people. Most of Ecuadorians are of the Hispanic mestizo culture which is a mixture of Amerindian and Spanish cultures despite their ethnic diversity. The Ecuadorian indigenous ethnic groups keep decreasing in numbers as multiracial ethnic groups increase.